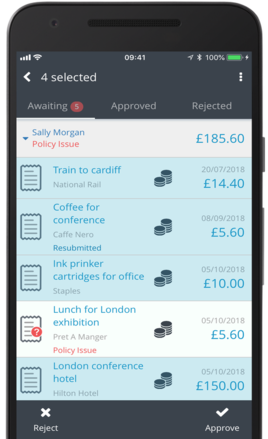 As an approver you have access to approve or reject a user's expense on the mobile app. Approve or Reject expenses Awaiting your review and access your Approver Approved and Rejected history. 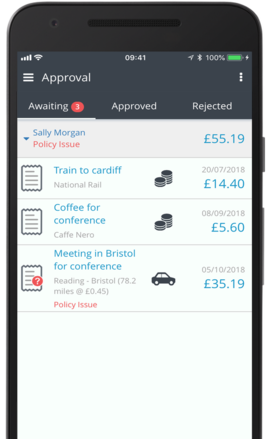 Expenses Awaiting your review and action can be found in the Approval area of the app. 1. Tap the three menu bars in the top left. 1. Under the Awaiting section tap the three dots found top right. 2. Tap Select... to choose the specific expenses you wish to action. Or, tap Select All. 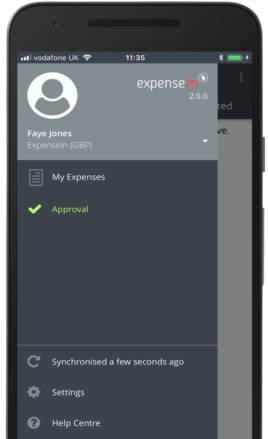 Tap the users name and tap the expense(s) to select the expense claims your ready to Reject or Approve. 3. Tap Reject or Approve, the expenses will be moved to either the Approved or the Rejected section. 1. Under the Awaiting section tap the user's name to see a summary of the expenses submitted. 2. Tap an expense to review the claim details. 3. Once details are reviewed, tap Reject or Approve. You will be taken back to your Awaiting approval queue. If no action is to be taken, tap the back arrow, found top left, to be taken back to your Awaiting approval queue. 2. Tap the users name to expand to see a summary of your Rejected expense claims. 3. Tap the expense to review the claim details. 4. Tap the back arrow found top left. You will be taken back to the Rejected section. 2. 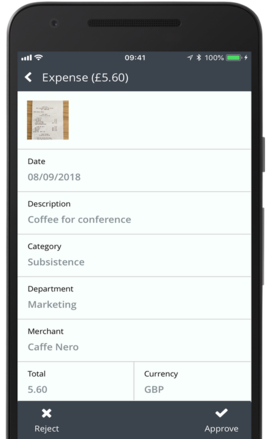 Tap the users name to expand to see a summary of your Approved expense claims. 4. Tap the back arrow found top left. You will be taken back to the Approved section.